INDORE.SEP.14: The Advanced Homeopathic Medical Research and Welfare society conducted has conducted a Seminar at Pritam lal dua sabhagrah, Indore. The theme was mental diseases Psychological Disorders & Homeopathy and stress management. Dr. Narendra Dhakad, Additional Director, Education Madhya Pradesh Indore Division was the Chief Guest. Dr. Sharad Pandit, Joint Director, Health & Family Welfare, MP Indore Division was the Guest of honour. The Special Guests were Shri Shirish Shukul, First class Magistrate, District Court Devash & Rachna Thakur, Deputy Registrar, Vikram University Ujjain. Dr. A.K. Dwivedi presided over the function. In the scientific session, Dr. Saran Swaroop Kochhar, the key speaker emphasized on the term psychiatric disorder and its remedies through homeopathy. Dr. P.N. 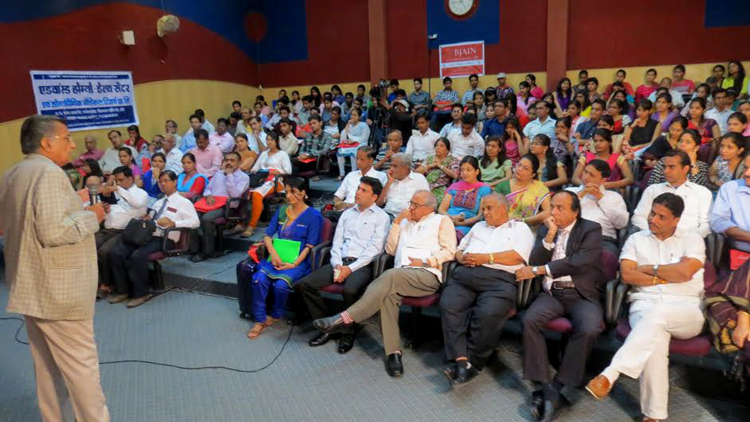 Mishra, Director Institute of Management Studies, DAVV discussed on stress management. Shri. Mukuldas of B.Jain Homeopathic Medicine manufacturing Company New Delhi talked about how technology is useful now days in Homeopathic practice. Dr. Nivirti Mishra coordinated the event. The organizer, Dr. A.K. Dwivedi thanked the gathering.